RIGHT SPEAK: This is an Outrage....Where is Gov Christie? 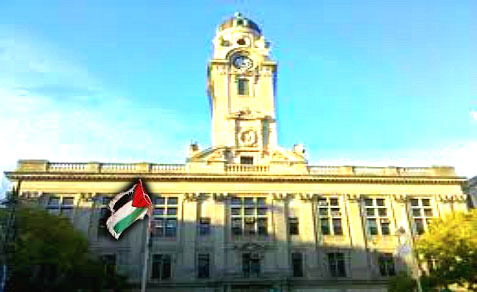 On the same day that many Americans were celebrating Israeli Independence Day, Paterson, New Jersey Mayor Jeffrey Jones named Sunday, May 19 “Palestinian-American Day” in his city, and a Palestinian flag was hoisted over Paterson’s City Hall. Jones presented a city proclamation commemorating the event. Congressman Bill Pascrell, Jr. (D-NJ9) was also there for the flag raising. Pascrell presented a letter of Special Congressional Recognition, and New Jersey Assemblyman Thomas Giblin (D-NJ34) presented a ceremonial resolution marking the event. 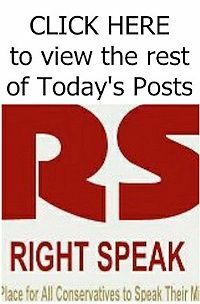 Although the organizer of the event, Khader Abuassab, said he had received nasty phone and text messages prior to the event, the day went forward with no counter-demonstrations or public hostility. Approximately 120 people showed up, to dance, cheer and yell “long live Palestine,” according to NorthJersey.com, as reported in Jewish World Review. Who organized this event? A maggot and convicted felon named, Khader Abuassab. I'm sure an unstanding Citizen..right? WRONG? According to a Feb. 2012 Press TV interview, Khader Abuassab has served on the Paterson Board of Education and has run for City Council. And what qualifications and expertise would qualify him for a seat on the Board of Education, City Council, and to organize a city wide event you ask? In 2002 Khader Abuassab pled guilty to having racked up more than $615,000 in credit card fraud, using 40 different credit cards to circumvent credit limits on the cards, and then filing for bankruptcy to erase the debts. Abuassab admitted he had not intended to pay for the things he charged. In 2004, Abuassab was sentenced to 13 months in prison, with two additional years of supervised release. In addition, Abuassab was ordered by the federal district court judge in New Jersey to pay $620,000 in restitution. No information was readily available about what Abuassab had originally used the money for, and whether it had all been paid back. You have to Read the whole story HERE.There is so much more to this. Where does NJ Gov Chris Christie stand on the actions that took place in Paterson? Why can't he as Governor apply pressure on Paterson, TO CLEAN UP THEIR ACT? He controls the purse strings for the state. I'd be willing to bet that Paterson is getting more from the state than they're paying in taxes. He's planning his next big day with Obama. Indeed, we can't go having anything silly occurring, you know, like politicians actually working together for the people and not party. Damm if that were to occur. Is anybody there? Does anybody care? Muslims also danced all over the 'graves' of our SEALS, and Obama arranged that funeral. One of those fellows could have been my son. Sharia is anit-freedom. This isn't diversity. This is conquest and suppression and violence. The only thing Christie and Obama worked together on after Sandy was posing for great photo-ops. The people of New Jersey, New York and Connecticut were the least of their concerns. While many here were bootlicking this fat slob, I was exposing him as the phony he is.